Searching online for manga printables suitable for an 8 year old, we stumbled upon Alexander Henry's anime inspired Thunder Flower fabric. My daughter thought it 'so cool' and loved the heroic karate kicking girls with blue and green hair leaping through cherry blossoms. It's now out of print but I managed to track down a couple of metres in her preferred blue colourway. Red and pink versions of the fabric are still available on Etsy but I think I was lucky to get one of the last pieces of it in blue. 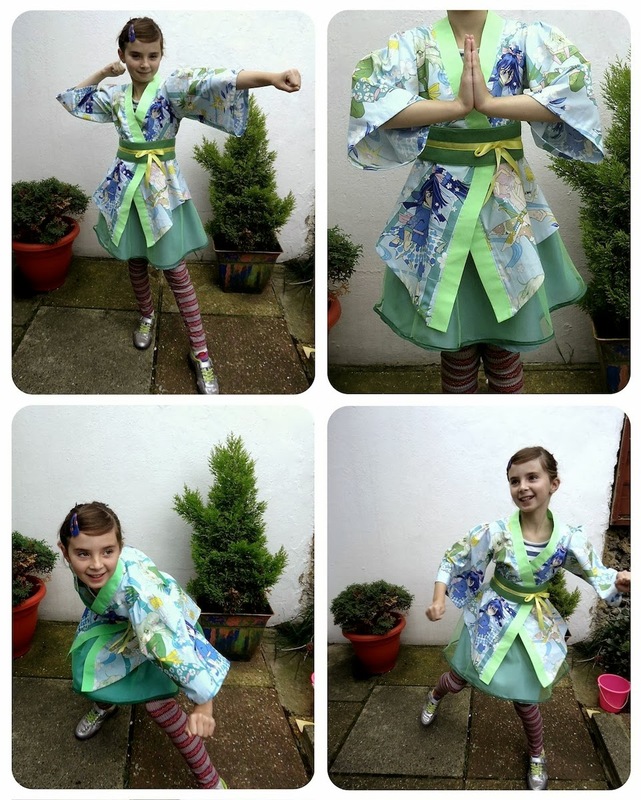 It seemed the ideal fabric to use to make her a Simplicity 2069 kimono costume to wear to Brighton Japan Festival. We went to The Fabric Shop in Worthing for the rest of the material. She chose mint coloured cotton for the collar, thick green felt and a yellow ribbon for the obi sash and some pistachio lining fabric and green net for the skirt. Spoilt from using straightforward Japanese sewing books, it took me so long to cut out the numerous tissue paper pattern pieces for the jacket, obi and two-layer skirt for this Simplicity outfit that it left me feeling completely exasperated and I abandoned the project.